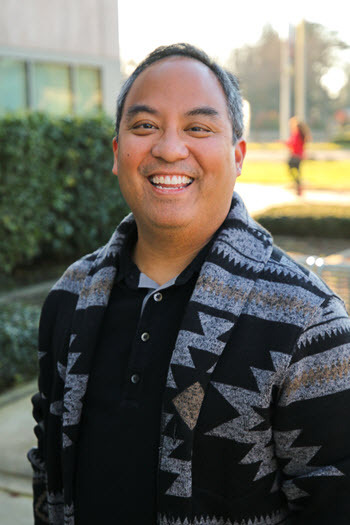 For Mark Alabanza, returning to college to pursue a doctorate in education wasn’t foremost on his agenda. He had a master’s degree and a great job as associate director for academic personnel at CSU Monterey Bay, where his husband is a tenure-track professor. So, if a doctorate were to be in Alabanza’s future, everything about the program — including the proximity, class hours and relevance to his career — had to be just right. And he found that perfect fit at Stan State. How perfect? Not only is Alabanza, 43, on target to earn his Ed.D. in Educational Leadership in May 2020, but he also is bringing positive attention to Stan State by being selected for two postgraduate honors. He’s one of only two students in the CSU system to be selected to participate in the 2019 David L. Clark Seminar, a two-day event for emerging educational administration and policy scholars, April 5-9 in Toronto, Canada. In addition, he’s one of 20 graduate students nationwide to receive the 2019 Student Scholarship for the National Conference on Race & Ethnicity in American Higher Education, to be held in Portland, Oregon, in late May. Alabanza’s research interests include higher education student services, with a focus on support for historically marginalized populations. His dissertation research explores Native American student identity and education system navigation in public, postsecondary education. Alabanza grew up in Virginia, and his parents — his father was a doctor and his mother was a nurse — are Filipino immigrants. Alabanza has no Native American ancestry and admits that public schools on the East Coast tread lightly around Native American history. So how did he come to find interest in this particular underserved population? Alabanza earned his bachelor’s degree in music from the University of Virginia, and for several years earned a living performing in musicals with regional theatre companies. One of those casting calls landed him a role in California, where he met his husband, and stayed. He started working in retail, then landed an office position with a UC Santa Cruz outreach program. From there he moved on to a human resources job at the Stanford School of Medicine and realized that if he wanted to move up professionally, he’d need a second degree. He earned his Master of Science in Management at Notre Dame de Namur University in 2013 and vowed to be done with school. But it didn’t take long for higher education to come calling again. When Neddeau, a Hollister native, was hired at Monterey Bay, their need to look elsewhere for jobs ended. At that point, Alabanza decided that the best way to position himself for a future job was to earn a terminal degree. Alabanza gives a lot of credit to his instructors in the program, and has a great appreciation for the camaraderie that has been built among the 10-candidate cohort.